Though there are many many versions of kurma, masala or other curries, creating a new curry seems to really entertain our taste buds. As the name suggests, this dish is spicy enough, with loads of vegetables in a tomato base, that is flavored with the Indian spices. 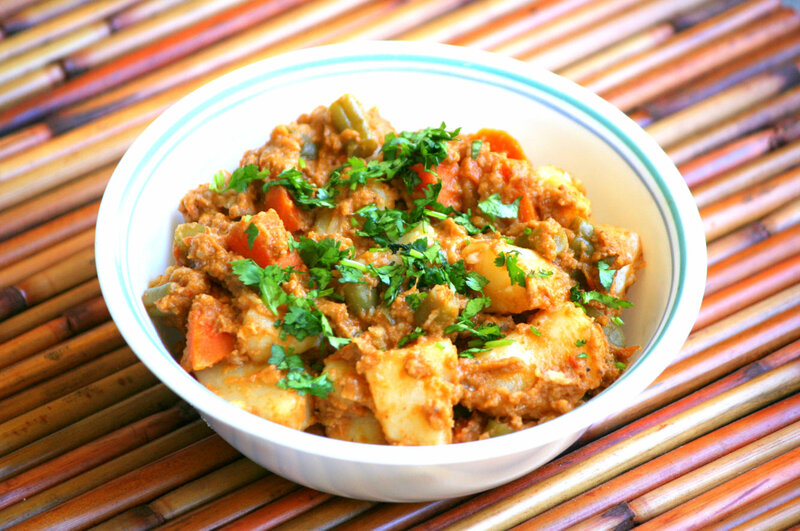 This curry will go really well with rotis/chapathis, parathas or even pooris. Keeping the base gravy the same, any one vegetable or combination of vegetables can be added. The vegetables I would suggest is, either only potato or only cauliflower or both potato and cauliflower, including or excluding carrots, beans and peas. Here's how I prepared. Grind it along with 2 green chillis and 1 cup coconut milk. Boil the carrots and beans in a quart of water. When it is half cooked, add the cauliflower and allow the content to boil till the vegetables are well cooked. turn off heat and keep it aside. Mean while, when the vegetables are cooking, heat a teaspoon of oil in a kadai and saute the onion. When the onions turn light brown, add the ginger and garlic and saute for a minute. Then add the chopped tomatoes. Fry for a couple of minutes and turn off heat. Let the content cool. Puree the onion tomato and keep it aside. Heat oil in a wide kadai and pour the tomato onion puree. Add water that was used to cook the vegetables and allow the content to boil for about 10 minutes. Add the ground curry paste and salt and mix well. Let it boil for another 5 minutes and now add the vegetables (carrots, beans and cauliflower) that are cooked along with the cooked potaotes. Adjust water to desired consistency not make the gravy too watery and allow the content to cook stirring occasionally allowing the spices to combine. Adjust salt. Turn off heat and garnish with finely chopped coriander leaves. Serve hot with fresh rotis or parathas or pooris. very yumm..spices addition r perfect..
absolutely love your curry paste. I made this for my kids and they loved it a lot.I am a single father and your posts has improved my cooking.Thanks for that. Awesome..Thanks for posting this..First time here..I am your new follower..Do check my blog sometime..
Vegetarian food always have loads of variety. Too many experiments can be done with vegetarian food. I loved this recipe. This again shows the variety of vegetarian food.